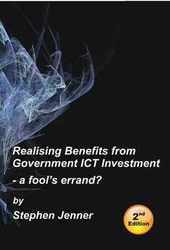 Realising Benefits from Government ICT Investment: a fool’s errand? "Jenner provides very credible guidance and methods on ICT project value realization in the public sector. This book is timely, practical and a very good primer on contemporary "best practice" thinking in both the public and for-profit sectors. The big question is: will public sector managers and executives have the "will" to put the book's prescriptions and methods into everyday practice with ICT Projects? The value of taxpayer services and contributions depends on their response." Donald Marchand, Professor of Strategy Execution and Information Management, IMD.